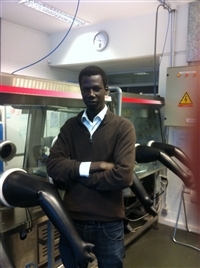 Ahmadou Ly received his civil engineer degree from the ENSISA (Ecole Nationale Supérieure des Ingénieurs du Sud de l’Alsace) in 2009, completed one year later with a Master Degree in Materials Engineering from the University of Strasbourg, France. He then accomplished his diploma work within the Center of Materials Research of Arcelor-Mittal of Liège, Belgium. By the end of 2010, he joined Materia-Nova and got appointed as a researcher in the laboratory for Chemistry of Novel Materials (CMN) of Prof. Roberto Lazzaroni. Throughout several applied research projects devoted to materials and involving collaboration with major industrial partners in Wallonia, he contributed to the development of the experimental activities of the laboratory and devoted to organic electronics and dealing with the fabrication and characterization of organic photovoltaic (OPV) and light emitting diodes (OLED). Coping with the large variety of different materials, device configurations but also project requirements, his technical skills now broadly encompass solution processed to various high vacuum deposition methods so as optical, compositional and electrical characterization tools.